One of the classic long-keel cruisers, the Nicholson 32 was one of the first boats to be designed from the outset for GRP production. The Nicholson 32 remained in production for almost 20 years, in various Marks ranging from Mk I to Mark XI. The interior is small compared to modern 32-footers, but the boats are greatly loved by many serious sailors for their seaworthiness and strength. One result of this is that many Nicholson 32s have had a hard life of long-distance cruising. The Nicholson 32 was designed in 1962 by Peter and Charles Nicholson of Camper & Nicholsons, then one of Britain's most prestigious custom boatbuilders, as a good value mid-sized cruising boat. 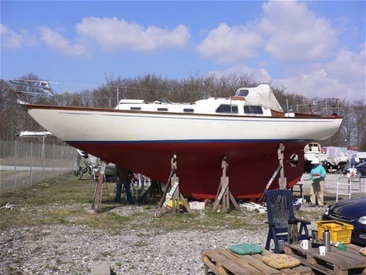 The Nicholson 32 was the first time the company had set up series production, and early boats were completed by an aircraft company under contract, as Nicholson's yard was not set up for mass production. 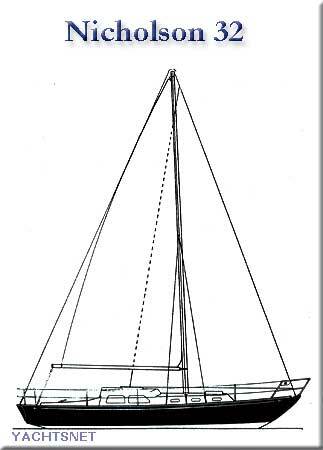 The Nicholson 32's long-keel hull was a development of the wooden South Coast One Design hull form, and was aimed as a cruiser-racer type. The waterline length of 24 ft was at the time the minimum allowed to compete in offshore racing events. The hulls were all moulded by Halmatic, and from 1966 onwards the boats were both moulded and completed by Halmatics. The design went through many minor modifications over the years from Mk I to Mk VIII, and the last boats built (Mk X and Mk XI from 1972 to 1981), had modified mouldings and a slight increase in hull size. Around 370 Nicholson 32s were built by Halmatic over the years, with a few more made in Australia. Few other yacht designs of this size have remained in production for such a long period. Finis Terre gøres forårsklar 2011 i Faxe Ladeplads. Helle er gang med den sidste gang bundmaling. Finis Terre is a long keel ofshore sailyacht - beautifull lines, and a heavy weight in the keel - very good in stormy weather and high sea.